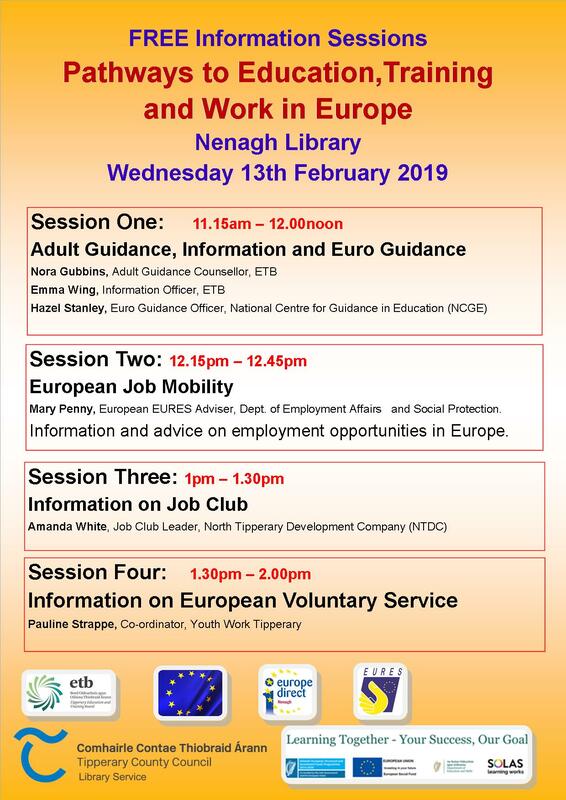 “Pathways to Education, Training and Work in Europe” is a free information day for adults and young people seeking guidance on career and further training options, both in Ireland and the EU, which will be held in Nenagh library on Wednesday, 13th February. This series of information sessions is being run by Nenagh library in co-operation with Tipperary ETB And the EU Information Centre Nenagh. The following timetable shows what’s available on the day. You are welcome to attend the full day or just the sessions that appeal to you. No need for booking as all are welcome. Mary Penny, European EURES Adviser, Dept. of Employment Affairs and Social Protection. Information and advice on employment opportunities in Europe, including the practical, legal and administrative issues involved in finding and accepting a job abroad.